Andrea McCoy, MD, an associate professor of pediatrics at Temple University's School of Medicine, in Philadelphia said, “A lot of toddlers' food issues are actually just power struggles". According to the experts, usually, toddlers are unpredictable with their food habits. Sometimes, feeding a toddler (1-to-3 years old) become a challenging task for parents because, the child's health and growth are important at the time of this stage. Remember, a toddler's appetite can vary every day, but a parent should be careful about the toddler’s growth and health. The article is offering you complete eating guidelines on feeding issues, health and budget-friendly meal and snack ideas, safety suggestions, and many more. You can offer the same food that you enjoy. Cook well and add different flavors to make the food more delicious. You can categorize the foods into 4 groups such as Fruits and veggies, cereals, milk, and meat. Make a whole meal plan, including breakfast, snacks, lunch and dinner. Select foods and serve that your child prefers. Water is the best drink for your child. Try to give water to your child in between meals and snacks. However, breast milk can be offered to a toddler, but a child who no longer breastfeeds can take pasteurized whole cow milk. Offer 2 cups of pasteurized whole cow milk every day. Add the milk to meals and snacks and feed your child. If your child doesn’t take cow milk, then talk to your doctor for advice. Try to avoid juice or sugary drink (sports drinks, fruit beverages, and fruit-flavored drinks). Love for drinks (milk, juice). Your younger toddler can be a picky eater. Slower growth is also common in the second year. Food habits can be changed drastically, but that doesn’t mean your child is not well. Your toddler may not follow a regular eating pattern as well. This time, a child tends to intake small and regular snacks because they provide enough energy for moving all the day. So, don’t force your child to finish all the food on the plate. Provide healthy snacks to maintain the nutrition level. Refusing to eat food is quite common among toddlers. Don't feel disheartened, helpless or think the child doesn’t like the food. Offer the food on another day, your child may eat it. Offer the same food that the rest of the family eats. Offer new foods that your child like. Keep offering even the child refuses. Create a pleasant environment before serving food. Don’t force the child to finish the food. Allow your child to explore the food, even if the child creates some mess. Don’t force the child to finish the food quickly. Be careful when your child is eating. Ask your child to sit down while eating. Don’t offer small hard foods such as carrot, nuts, popcorn, lollipop to reduce the risk of choking. Offer steamed or boiled vegetable sticks as finger food. Always offer water or drink from a cup and supervise your toddler while drinking. Slower growth for long time. The child is less energetic, unwell and not eating at all. Mealtimes are becoming full of stress and fight. Older toddlers are also unpredictable with their food habits. It’s quite common at the age of 2. Sometimes, your child loves a food one day but refuses to eat the same food in the next day. This kind of unpredictable food habit can make you frustrated. But, there is nothing to worry about. This is quite a common eating behavior of older toddlers. Showing interest in their favorite foods. It has been found that appetite and hunger can vary among older toddlers. They may feel more hungry during the daytime and feel tired and less hungry at evening time. Older toddlers love to drink milk or other sweeter drink than solid foods. If the toddler eats snacks frequently, then the hunger for the main meal can be reduced. 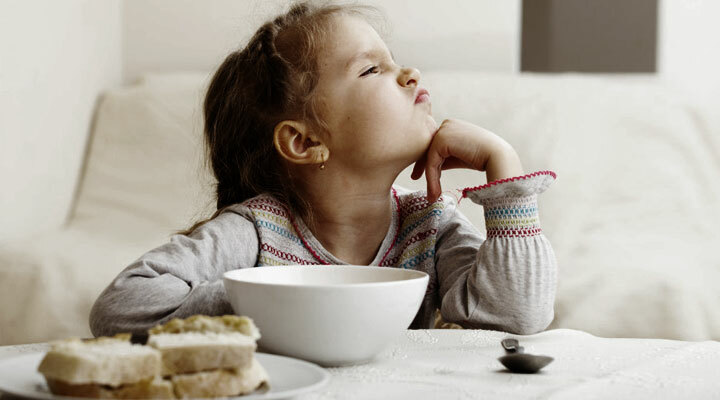 Food refusal, love for snacks are quite common behaviors of toddlers. There is no reason to worry about the health of an older toddler unless he/she looks unwell or grows slower than usual. Keep patience and don’t force your child to eat. Serve small and new foods. Ask the child to sit comfortably on a chair. Give a spoon or a small fork to eat, give more if required. Older toddlers tend to copy their parents. So eat well your child will copy you. Develop some good habits in your growing child such as exploration of foods, shapes, learning about cooking, cutting veggies, stirring the liquid meal, sharing foods and so on. Offer healthy and interesting snacks for the older toddler. Make sure the snacks are healthy and nutritious. Frozen yogurt in hot weather. Create a meal plan at the beginning of the week, including breakfast, lunch, dinner and snacks. Make a grocery list according to the meal plan for the whole week before hitting the store. Don't buy pre-packaged or processed foods for your toddler. They’re high in sodium and other harmful chemicals. Keep ready some easy and healthy snacks for your kids such as washed fruits, string cheese, raisins etc. Shop groceries from your local market. Search on the Internet to get easy recipes for making healthy baby foods, snacks, lunches, and dinner. Rice, bread, pasta, potatoes and noodles Buy in bulk. Store bread in the freezer to keep it fresh. Milk and other dairy items Take advantage of the special offer and buy milk and other dairy product like cheese in bulk. Store them in the freezer to keep them fresh. Vegetables and fruits Always buy these seasonal fruits and vegetables. They are cheaper and taste good as well. I hope, the information is helpful for parents who're currently dealing with mealtime dramas. If you’ve better ideas then share with us. Don’t miss out - How to pack healthy yet affordable lunch for back-to-schoolers?